It’s tough to clean the area that hides behind the toilet, because there is so little room to maneuver between the bowl and the wall. Your usual broom or mop probably can’t handle the job, and this is an area that can easily breed a mold and/or mildew problem. RightatHome.com recommends that you “bite the bullet” and crouch down on the floor armed with plastic gloves, wearing clothes you can afford to get dirty. 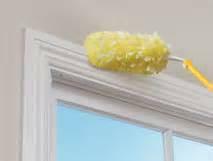 Use a strong-bristled brush to sweep away dust and dirt, and then wipe the area down with a damp sponge and an eco-friendly cleaning solution. Because the area could easily remain damp, wipe it dry with a paper towel after cleaning.